Context: The presence, course and shape of the accessory pancreatic duct have not been previously studied in patients with chronic pancreatitis. 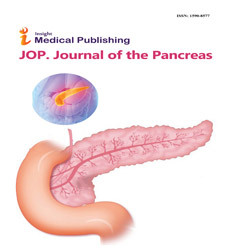 Objectives :The accessory pancreatic duct exhibits several appearances on pancreatography. It was examined using dyeinjection endoscopic retrograde cholangiopancreatography, and the duct course and shape were studied in patients having chronic pancreatitis and were compared to patients with normal pancreatogram. Design :A prospective comparative study was carried out. Patients :One hundred and 57 consecutive patients (79 males and 78 females) who underwent endoscopic retrograde cholangiopancreatography for suspicion of pancreatobiliary disease. Setting :Forty-eight patients were diagnosed as having chronic pancreatitis using endoscopic retrograde cholangiopancreatography (28 alcoholic, 4 metabolic, and 16 idiopathic) and 109 patients had a normal pancreatogram. Main outcome measures: The insertion type of the accessory pancreatic duct to the main pancreatic duct was determined and the terminal portion of the accessory pancreatic duct was described in both groups. Results :In patients with chronic pancreatitis, the insertion of the accessory pancreatic duct of short type prevailed; 31 patients (64.6%), independently of the degree of intensity of chronic pancreatitis. However, in patients with a normal pancreatogram, the intermediate and long type prevailed, 46 (42.2%) and 41 (37.6%) patients, respectively. In patients with a normal pancreatogram Stick type termination occurred in 66 patients (60.0%), and in patients having chronic pancreatitis, the Cudgel type was present in 34 patients (70.8%) which was statistically significant. Conclusion :The accessory pancreatic duct should be analyzed when we carry out the cholangiopancreatography because the patients with short type insertion have a higher risk of developing chronic pancreatitis.